Simpsons Collector Sector - Now Powered by Nulocules! 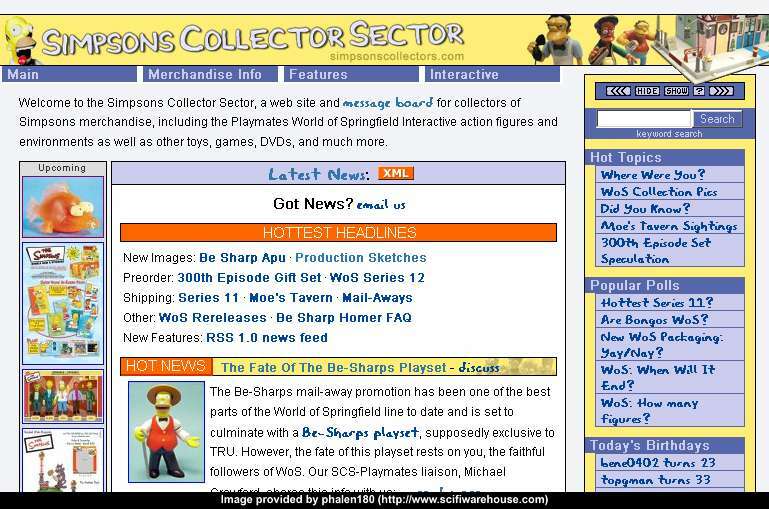 Welcome to the Simpsons Collector Sector, a web site, Facebook group, and Tapatalk forum (former ezboard message board) for collectors of Simpsons merchandise, including the Playmates World of Springfield Interactive action figures and environments as well as other toys, games, DVDs, and much more. Like Our Favorite Family, we're still going after all these years. Problems you have noticed with the site or that you continue to notice with the site ... my most sincere apologies. If you were born in the last 35 years, and spent any of that time watching American television, odds are you learned a thing or two from The Simpsons. Some of us remember many more pearls of wisdom from the animated powerhouse THE SIMPSONS than from our own parents… which explains the continued success of donuts! Created by legendary “Life is Hell” cartoonist Matt Groening, THE SIMPSONS is celebrating its 500th episode in February 2012, and Kidrobot is honoring the father of primetime animation in the only way we know how – making him into a 6-inch vinyl toy! Complete with goatee and glasses, director’s jacket, and pad and pencil accessories, it is the first EVER Simpsons Matt Groening toy. Available February 9, Matt retails for $50 (£40.10 UK) at Kidrobot stores, kidrobot.com and select retailers. See the above link for images! TVShowsOnDVD.com has confirmed a December 6 release date for the Season 14 DVD and Blu-Ray sets. It looks like there's a lot of good extras in this set. Burger King has some great Simpsons promotions in the past decade, the most recent being to promote 'The Simpsons Movie' in 2007. Now they're back with another great Treehouse of Horror-themed set of toys! The promotion is already under way, so best to check out your local BK before they run out. As a reminder, many BKs will let you purchase the toys without a food order. TVShowsonDVD.com reports that Simpsons producer David Silverman has tweeted that the Season 14 DVD set "will be released late this summer". That probably means another August release. Another tweet from "Weird Al" Yankovic has confirmed that he is part of the audio commentary for the episode, "'Three Gays of the Condo'. There has been no official announcement yet from Fox on this set. Howdy, fellow collectors! Recently, I received some inquiries about the broken message board link on the main website menu. It should be fixed now. For future reference, this is the new link. Update your bookmarks! Hey Simpsons collectors! A lot of interesting stuff has come out recently. Here's a quick roundup of the big stuff, so everyone can catch up. Did we miss anything? Let us know! -Kid Robot series 2 vinyl toys: Kid Robot is back with more blind-boxed fun and frustration. Funstration! To order a full case, simply change your quantity to 20. So far, zombie variants aside, Moleman appears to be the hardest to find. -Kid Robot's 6-inch Lard Lad vinyl toy: The latest in the larger-scale Simpsons by Kid Robot (Kang/Kodos and Ralph went fast), this is the most adorable representation of the character yet. -Simpsons World: The Ultimate Episode Guide (Seasons 1-20): Oh sure, we all bought the earlier guides, but this is still worth picking up. Besides being current through Season 20, it's a beautifully collected (and heavy) comprehensive guide. What's more... the episode guides for each season have been updated and, in many cases, are twice as big as before. -The Simpsons: The Thirteenth Season DVD (blu-ray): Don't let the haters get to you, there's still a lot of great episodes in this stretch of the show's run. No word yet on a release for Season 14. -Homer Simpson Holiday Glass Set of 4: Check your local Target store for this set of 4 holiday-themed pint glasses. I found mine in the houseware section. As always, our forums are the best way to keep up on the latest news! 11/29/2010 Apologies for the Technical Difficulties! Kid Robot-- maker of creative vinyl toys-- has been continuing to release new Simpsons products. This summer, they released a 6-inch Lard Lad, which is still available. Now, they have announced a second series of their regular, blind-boxed 3-inch figures. The 25 piece set includes mariachi and zombie variations of the 5 Simpsons family members, as well as many new characters. The set release date is October 28th. The news was announced recently that Season 13 was coming to DVD and Blu-Ray on August 24th. Featuring Ralph on the cover (with a special alternate 'head box' as usual), the set will also feature the usual amount of great extras and commentaries that we have come to expect from these sets. But, perhaps, more excitingly, TV Squad brings the news that "fans will have the opportunity to score the set a full month earlier at San Diego Comic-Con July 22-25. Fans who purchase these early copies of the season set will also receive a collectible limited edition lithograph as a free gift." No details beyond that are known at this time. For those attending the San Diego Comic Con next month, here is some additional news of interest... First and foremost, the Simpsons TV show panel will take place in Ballroom 20 on Saturday the 24th between 1:30 – 2:15pm. The time and date of the Bongo Comics panel will announced with the full schedule soon. The SCS will, of course, have its annual meet-up on Friday the 23rd at 6pm. However, we will not be meeting inside the convention center this year. Instead, we will be in the Santa Rosa Room at the Marriott Hotel & Marina right next door. Hope to see you then!